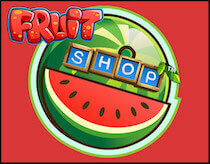 Experience that classic money rush on the reels of Fruit Shop. This game gives you tons of chances to land free spins with its clever activation mechanic and juicy prizes. Want to feel a sweet, citrus splash with your spins? Then Fruit Shop could well be the slot for you. This up-beat, pacey and high energy game will have you peeling the wins off the reels as you go in search of that refreshing big money pay-out. Fruit Shop has 5 reels, 3 rows and 15 fixed pay-lines. Use the COIN VALUE button to set your coin size. Use the BET LEVEL button to assign the number of coins per line, up to a maximum of 10. The MAX BET button will start a game using the current coin size at the highest bet level possible. When you want to start your game, hit the SPIN BUTTON. When the reels stop in place, all your wins are calculated and the prizes paid, before any free spins are initiated. Use AUTO-PLAY to set the game into automatic spin mode. There are two clever bonuses waiting for you on the reels of Fruit Shop. Wild Multiplier – the wild symbol on this slot machine not only helps you complete winning combinations by substituting wherever possible, but it also doubles the value of the associated prize. Free Spin Round– hit any standard fruit symbol win line bet to trigger your free spins. Any prize you hit from a free spin is instantly doubled. Land any winning combination during free spins to add further spins to your count.